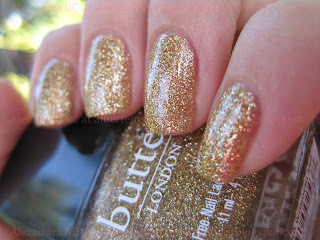 I showed you this before as an udercoat, but it really deserves a post by itself, this glitter is just amazing. It has slowly become a staple for me, because it is so easy to apply and it dries so fast. I love the little bits of red it has too. So pretty! I don't remember seeing this one at my Ulta, I'll have to look for it! @ Laura: I've seen it at Nordstrom too! EEEK! That looks so beautiful! That's it ... straight to the top of my pile to try!! @ Sarah Claire: You'll love it! That's so lovely! 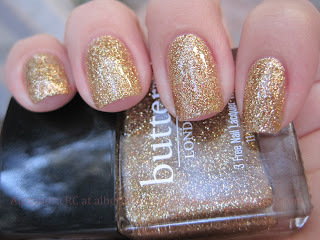 I'm dying to try Butter polishes. Thanks, this one and Wallis is what got me into the brand. how did you get the surface so smooth? I own the same nail polish but it still shows up gritty on me. Should I do a few coats of top coat, or is it a specific top coat that works best? Thanks! I will definitely try the posh layering combo. I am currently having issues with Butter London black night. I absolutely love the color, but it does dry a bit gritty for me, so i'm excited to try the layering technique so that the colors really shine :-).